There are seemingly endless possibilities in which anxiety can interfere with your life and cause discomfort and frustrations. It just creeps in and overwealms you. No need to stress! Dare I say, treating anxiety can be kind of, well, fun? The key is getting in touch with calm thorough body movement and mind opening techniques. Interested? There are natural ways to help calm your anxiety and help you to feel better about life. These rather fun remedies can work wonders when you make them a regular part of your routine. So… are you ready to learn more? Get up, and move! This is one natural treatment you can do that does not cost a penny. Try to relax the body with exercises like Yoga or Meditation. Yoga is great to help your mind destress and release that is overwealming you. You can do these all in the comfort of your own home, or with a friend if you prefer some companionship. Let the stress disappear by stretching your body and releasing the tension you are holding onto. You will literally be able to feel your problems drift away from your fingers down to your toes. Putting your experiences of anxiety into a new context, re-framing them, allows you to control them for better mental health. It’s as if you can turn down the volume by channeling that terrible anxiety through a body space. So when you feel your anxiety, let out! Tell others, express your emotions. Next time your anxiety creeps up on you, try expressing it to whomover you are with. Literally tell them. “My anxiety is really catching up to me.” Take a second and talk out your problems. You will be amazed and how effective this can be. Did you know that when you exercise, your body produces substances called endorphins? Endorphins are formed inside the body to help alleviate pain and spur on a feeling of well-being and relaxation. Endorphins have a similar chemical structure to morphine. The transmission of these natural chemicals can make you fall asleep faster, and may help in the reduction of high blood pressure. 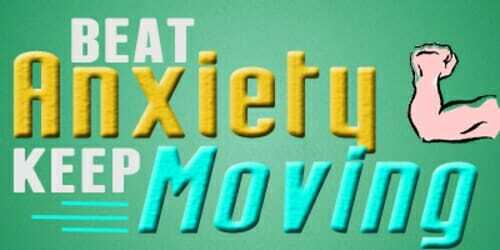 If you are suffering from anxiety – you will want these! I suggest getting the help of a personal trainer when you work out. Not simply because it is safe, but it gives you a person to talk to and couch you along through your workout process. A Certified personal trainer will be able to craft a specific workout plan for you, based on your needs. He or she can map out a daily/weekly routine that will focus on relieving your stress and daily anxiety.